At Lithia Chrysler Jeep Dodge of Missoula, we’re excited to have the all-new Jeep Gladiator arriving in Spring 2019. The midsize pickup truck has been rated best-in-class in several categories. Plus, there are some great aesthetics to be aware of, too. The Gladiator is best-in-its class when it comes to towing. 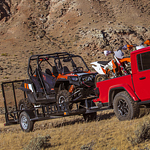 You can tow up to 7650 pounds of boats, campers, ATVs, and more. You will also have best-in-class payloads, allowing you to put up to 1600 pounds into the truck bed itself. You’ll love the amazing colors that the Gladiator comes in. It definitely has the Jeep look, complete with the seven-slot grille and the rounded headlights. The taillights look as though they have been bolted into place. The doors can be removed. There are a few roof options, allowing you to personalize the look. Plus, you can upgrade to different trim levels based on how rugged you want your Jeep to be.